This entry was posted in #amwriting, #writetips, advice for fiction writers, author intrusions and tagged believable characters, Captivate Your Readers, characters, credibility in fiction, Fire up Your Fiction, Jodie Renner, writing craft by Jodie Renner. Bookmark the permalink. I’d love to received a copy of your upcoming book. That’s great, Joe. Email me at info(at)JodieRenner(dot)com to receive an ARC. And let me know whether you’d like it in mobi for your Kindle or PDF. Or I can try to turn it into an ePub file for other e-readers and iPad. Jodie, good morning. Great post! Great summary of those factors we plotters need to be reminded of. These are certainly things I continue to struggle with. I’ve read James’ STORY TRUMPS STRUCTURE and I’ve tried writing “organically.” But I’ve come full circle from plotting to pantsing and back to plotting again. James Scott Bell’s SUPER STRUCTURE and WRITE YOUR NOVEL FROM THE MIDDLE were very helpful in this discussion. And I find I am more comfortable setting out on a journey if I know where I’m going. I am currently rereading James Frey’s HOW TO WRITE A D**N GOOD (NOVEL, THRILLER, MYSTERY). His ‘step sheets’ are basically detailed synopses with each scene being summarized as a separate entity, allowing the author to think in detail about the scene without writing it. It then becomes easy to move scenes around. A lot easier to change scenes as the writer sees problems with plausibility and causality. A more efficient way to play with the plot. And for me, a good compromise between just an outline, or writing completely organically. Sorry, I digress. Thanks for a great post! So glad to hear you’ve found a method that works for you, Steve! I’ve read all of those writing craft books you mention above, and they’re all excellent, in different ways. The trick is to find a method that works for your personality and creative/work/writing style. I’m new to the killzone, but am already loving it and finding so much of value. I’d love to receive and review a copy of your new book, and thanks for the great post. So glad to hear you like our blog, Joshua! If you do a search on various topics, there are lots of real gems here! 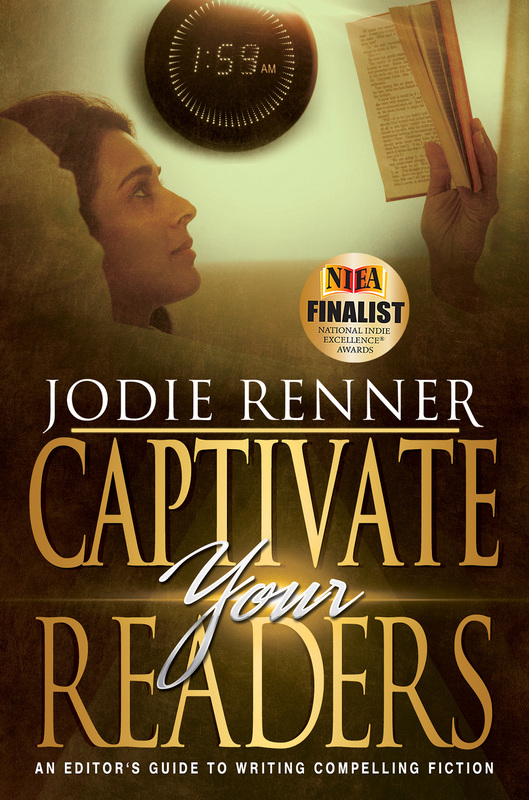 Email me at info(at)JodieRenner(dot)com for your ARC of Captivate Your Readers. PDF or mobi for your Kindle? The worst example of a character suddenly behaving both out of character and illogically is in Girl With the Dragon Tattoo. When Lisbeth sneaks into Martin’s dungeon to save Mikael, Martin, who’s coldly and methodically killed dozens of victims, totally panics and RUNS AWAY from a girl armed with a golf club. Now, he’s in his fortress, with guns and other weapons all over the place, but he decides to abandon it and try to escape in his Volvo. Okay. And it gets worse! Lisbeth pursues Martin on her little motorbike. As they race down the mountain, with the plucky Lisbeth hot on his trail, all Martin has to do is tap the brakes, and Lisbeth would squish against the rear of his Volvo (which I think is Swedish for “Tank for Civilian Use.”) But no, instead our previously calculating and unflappable villain loses control of his car and ends in a fiery wreck. And millions found this believable? There was a lot in that movie (and book for that matter) that strained credibility. But to be fair, in the book, Lizbeth DID have a gun instead of just a five iron. And Martin purposely drives head-on into the truck, so readers are supposed to assume he was so guilty about his past that he committed suicide? (meh…) I didn’t find either ending satisfying. But Salander was a good character..
Oh heaven’s yes. Characters that can suddenly shoot like Annie Oakley when the chips are down with no foreshadowing at all that they have firearms experience (I mean, how hard can it be, point and shoot, right?) Characters that can suddenly drive like Jeff Gordon (how hard can it be, right?) And the classic TSTL (too stupid to live) move without even a token, “You know this is stupid, right?” “Yeah, but the alternative is even worse.” in the dialogue. Almost as bad is the Mary Sue that comes pre-loaded with every Amazon skill known to mankind (she is a doctor who practices mixed-martial arts in between being a SWAT sharp-shooter reservist on the weekends,) all within the first few pages. Oh yeah, she’s totally hot as well, but with a broken heart that makes her doubt her ability to love again. Thanks for the writing suggestions!! I enjoy all your advice, Jodie. I agree with making your characters do logical actions. I hate reading a suspense book and a character does something that makes me scratch my head. I’m become frustrated and don’t know if I want to finish the book. I would love to read and review your new ebook, Captivate your Readers. Glad you find my advice here on TKZ useful, Kelly. And that really bugs me when that happens, too. 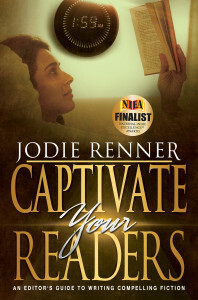 Please contact me at info(at)JodieRenner(dot)com so I can send you an ARC of Captivate Your Readers. I’ve been struggling with character; my tendency to move characters around like chess pieces results in some very manipulated scenes. In a recent episode of Downton Abbey, Ms. Baxter helps out Tom Barrow, who has been pretty cruel to her. I’m not sure if it’s in or out of character (I don’t really get the Baxter character), but I definitely didn’t understand her motivation. I’d love an ARC of your new book in Kindle. Shizuka, the fact that you recognize what you’re doing puts you way ahead of a lot of authors! Keep asking yourself, “What would this character actually do in this situation?” Good luck working it out! Yes, it’s so much more of a challenge to create an exciting plot while still staying true to what your smart, savvy character would actually do in that situation! If crit partners call you out on it, readers would notice it too, and could write some scathing reviews, so it’s best not to let these situations slip past. I’m sure the author of the manuscript I’m editing now is not happy about my comments that her intelligent, street-smart heroine just wouldn’t willfully put herself in such danger — repeatedly! Editors, beta readers, and critique partners are your first readers, so as you know, it’s a good idea to seriously consider their suggestions. Thanks so much for bringing this issue to the forefront. I find I have to really watch myself as I an in my 60’s and being post menopausal, I cannot have my 20 year old character pop off her mouth like I would, LOL. I would enjoy reading your book. I am very good at giving reviews that are actually reviewing the book. The what, the why and the rating. Thanks, Suzi. I just sent you an ARC of my upcoming Captivate Your Readers. Hope you find it useful for your writing! This is a great post. I would love to receive a copy of your new book in Kindle. This post has been very helpful as a reminder about character development. In my first book, in final production stages now, I had to go back and add those bits of background to lend plausibility. For the second book, I’m hoping to keep the characteristics in mind as I go along so I don’t have to fix as many in the rewrite. Thanks for your comments, Julie. Yes, it’s all about going back and showing the hero or heroine taking karate lessons or learning to pilot a small plane or whatever, so when those skills are needed they’ll seem plausible. Or of course, writing any special skills in as you go along. Great post Jodie and yes, nothing irritates me more then when a character suddenly morphs into someone else (often with superhuman powers) right in the middle of the book (and for no apparent reason except, as you say, to move the plot a along). I must admit I can’t watch Downton Abbey now because of the character issues – and the all too stupid plot contrivances. Characters need to grow and change but they cannot suddenly behave like imbeciles or trust other characters that have clearly shafted them a million times before! When reading, I find it easy to put the book down and think about something that seemed weird. Often, that will be the end of right there. On the other hand, with a movie you have that WTF moment, but the show keeps on rolling to the next thing. So it’s easy to go “meh” and let it keep going. Riding a motorcycle across a roof line was and end-of-story moment for Jason Borne. Like, oh please! That’s a very good point you make about movies or TV shows just rolling along, so we tend to keep watching anyway, whereas it’s really easy to slip out of the fictive dream in a book and lose faith in an author and just give up on that story and find another. And how did they even get a stunt man to ride a motorcycle along a roof line? That’s a really tough one to believe! I enjoyed the post and I’d love to receive a copy of your book. Your description of the kickboxing banker reminded me of an extremely straight-laced civic engineer I knew. In his spare time, he liked to go hang gliding. At first it seemed like an odd choice, but later it made sense to me. This was a good outlet for him since it was so far removed from his day-to-day life. That said, if I decided to use someone like him in fiction, I’m not sure if he’d be believable. I hope so, because the contrast is something I find fascinating. Thanks for your comment, John. Which book would you like? 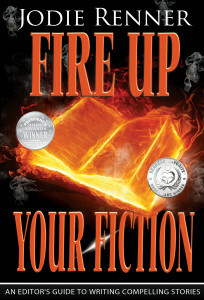 Fire up Your Fiction (no strings attached), or Captivate Your Readers in exchange for a review? And thanks for the reminder that seemingly straight-laced people can have daring pastimes on the side. I think if you built that into his character development right from the start, it would make sense. Thank you for the post, Jodie. Although I have read this information as beta reader of your new book, I re-discovered again many points valuable for my writing. This is what I liked about your book, it is a great resource, to which writers can come back again and again and find a lot of valuable information. You can’t keep all of that ready in mind while writing, some of the inconsistencies can sneak into writing without noticing. The list above and many other parts in your book provide great checklists and examination platform for the story to shine. I would like to enter the competition for your book Fire Up Your Fiction. I bought its earlier version some time: Style that Sizzles and would like to read the latest version of it. I found your post very exciting and helpful. I’d really love to receive an ARC for CAPTIVATE YOUR READERS for a honest review, if you don’t mind that the review will be in German. Of course, you’d receive a summary of my review in English as well. I read a passage in critique group today that made me comment on a character. The protagonist agreed too readily to a suggestion to join a house party. I felt she needed more convincing. This is one instance of where a character’s actions (in my opinion) needed to be better motivated, otherwise they weren’t consistent with her logical attitude.